Robin Olds was born on July 14, 1922, in Honolulu, Hawaii. He entered the U.S. Military Academy at West Point in July 1940 and graduated a year early due to World War II, receiving his commission as a 2Lt in the Army Air Forces and his pilot wings on June 1, 1943. After completing upgrade training in the P-38 Lightning, Olds was assigned to the 434th Fighter Squadron of the 479th Fighter Group and began flying combat missions in the European Theater in May 1944. Capt Olds destroyed 5 enemy aircraft and three probables while flying P-38's. He began flying P-51 Mustangs in September 1944, and added another 7 enemy aircraft and 1 probable to his aerial victory credits, plus he was credited with destroying 11.5 enemy aircraft on the ground. After the war, Olds served as a football coach at the U.S. Military Academy from October to December 1945, and then served at March Field, California, from January 1946 to October 1948. He served as an exchange pilot with the Royal Air Force from October 1948 to September 1949, and then served at March AFB from October 1949 to July 1950. 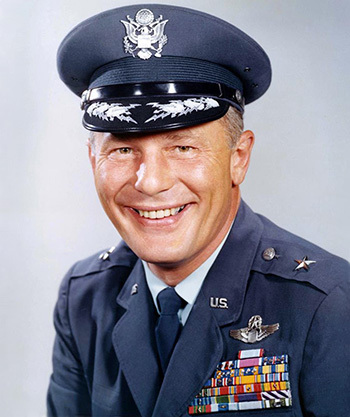 Olds served as commander of the 71st Fighter Interceptor Squadron, first at March AFB, then at Rome AFB, New York, until October 1950, when he became Base Commander of the 81st Air Base Group at Greater Pittsburgh Airport, Pennsylvania, serving until June 1952. Col Olds served at Stewart AFB, New York, from June 1952 to July 1955, and then became director of operations and later commander of the 86th Fighter Interceptor Group at Landstuhl AB, West Germany, from August 1955 to September 1956. His next assignment was as commander of the Aircraft Gunnery Group at the USAFE Weapons Center from September 1956 to September 1958. Col Olds served at Air Force Headquarters in the Pentagon from October 1958 to August 1962, and then went through National War College from August 1962 to August 1963. Olds then served as the commander of the 81st Tactical Fighter Wing at RAF Bentwaters, England, from August 1963 to August 1965, and then as the Assistant Deputy for Operations for 9th Air Force at Shaw AFB, South Carolina, from August 1965 to September 1966. After completing F-4 Phantom upgrade training, Col Olds served as the commander of the 8th Tactical Fighter Wing at Ubon Royal Thai AFB, Thailand, from September 1966 to October 1967. While in Southeast Asia, Col Olds flew 152 combat missions and added another 4 enemy aircraft destroyed in aerial combat to his total, making him one of only two people in history to have aerial victory credits in both World War II and the Vietnam War. After Vietnam, Olds became Commandant of Cadets at the U.S. Air Force Academy from November 1967 to January 1971. His final assignment was as Director of Aerospace Safety at Norton AFB, California, where he served from February 1971 until his retirement from the Air Force on June 1, 1973. Gen Olds flew 259 combat missions in two wars and was credited with destroying 16 enemy aircraft in aerial combat, with another 4 probables and 11.5 on the ground while strafing airfields. Robin Olds died on June 14, 2007. He was married to the actress Ella Raines from 1947 to 1976, and he married Morgan Barnett in 1978 and remained married to her until 1993. Colonel Robin Olds distinguished himself by extraordinary heroism in connection with military operations against an opposing armed force in Southeast Asia as strike mission commander on 11 August 1967. On that date, Colonel Olds led his strike force of eight F-4C aircraft against a key railroad and highway bridge in North Vietnam. Despite intense, accurately directed fire, multiple surface-to-air missile attacks on his force, and continuous harassment by MIG fighter defending the target, Colonel Olds, with undaunted determination, indomitable courage, and professional skill, led his force through to help destroy this significant bridge. As a result the flow of war materials into this area was appreciably reduced. Through his extraordinary heroism, superb airmanship, and aggressive leadership, Colonel Olds reflected the highest credit upon himself and the United States Air Force.